Native prairie is a grassland ecosystem. Grassland ecosystems cover between 41-56 million km2 (31- 43%) of the earth's surface. They represent one of the earth's major biomes and, historically at least, are one of the most productive and diverse terrestrial ecosystems. This framework applies to native aquatic and terrestrial habitats within the Prairie Ecozone of Saskatchewan which includes four eco-regions: Aspen Parkland, Moist-Mixed Grassland, Mixed Grassland and Cypress Upland. In North America, the central grassland region covers around one-fifth of the continent and represents 7-10% of the grasslands of the world. It extends over the widest latitudinal range of any single North American ecological region and constitutes a relatively continuous and roughly triangular area covering about 4.1 million km2. The central grassland region extends from the provinces of British Columbia, Alberta, Saskatchewan and Manitoba in Canada, south through the central, northern and midwest states of the United States to southern Texas into northeastern and central Mexico, and from western Indiana to the foothills of the Rockies. In their native state, the central grasslands supported rich and highly specialized plant and animal communities. The interaction of climate, fire and grazing influenced the development and maintenance of the central grasslands. The increasing amounts of rainfall from west to east define different types of native prairies. Short-grass prairie occurs in the south and in the west, in the rain shadow of the Rocky Mountains, with mixed-grass prairie in the central grasslands, tall-grass prairie in the wetter eastern region and fescue grasslands in the northwestern plains and parkland from central Saskatchewan to the foothills of the Rockies. 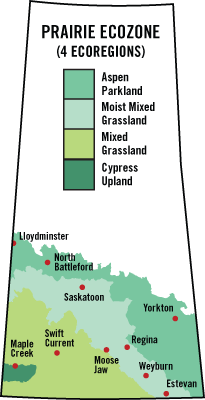 In Saskatchewan, natural prairie vegetation is dominated by spear grasses, wheat grasses and blue grama grass. Drier sites in the southwest support sparser grass cover with abundant prickly pear and sagebrush. Northward and eastward from the mixed grassland, moisture deficits are less severe and droughts are less prolonged. Here "mid-grass"-dominated mixed grasslands alternate with plains rough fescue grasslands, more extensive shrublands, aspen grove woodlands, and wetlands. The aspen parkland, the northern transition zone to the boreal forest, has expanded south into former grassland areas since European settlement effectively stopped prairie fires. Our remaining native prairie is a valuable resource that touches many lives and many interest groups. Some, such as ranchers, rely on the sustainable use of prairie for their very livelihood. For others, native prairie may be of cultural, spiritual or recreational importance. Many landowners, government and non-government agencies play a role in the stewardship and protection of native prairie as well, representing many interests. Integrating these efforts and defining common outcomes among the players is fundamental to effective prairie conservation. 1 Gauthier, D.A., A. Lafon, T.P. Toombs, J. Hoth, and E. Wiken. 2003. Grasslands: Toward a North American Conservation Strategy. Commission for Environmental Cooperation and the Canadian Plains Research Center, University of Regina, Regina, Saskatchewan. 2 Hammermeister, A.M., D. Gauthier, and K. McGovern. 2001. Saskatchewan's Native Prairie: Statistics of a Vanishing Ecosystem and Dwindling Resource. Native Plant Society of Saskatchewan Inc., Saskatoon, Saskatchewan. 3 Watmough, M.D. and M.J. Schmoll. 2007. Environment Canada's Prairie and Northern Habitat Monitoring Program Phase II: Recent habitat trends in the PHJV. Unpublished Report. Environment Canada, Canadian Wildlife Service, Edmonton, Alberta.